Now in the Atlas of Middle Earth apparently there is a drawing by tolkien that would indicate that Thangorodrim was about 35,000 ft high. For comparison that is a good bit taller than Mt. Everest which is 29,029 feet. I cannot confirm this right now as my copy of the Atlas is on loan to a friend but that seems reasonable to me. Anyhow, that means that Ancalagon the Black must have been enormous to crush them under his bulk. While obviously none of these other dragons were as big as Ancalagon, I imagine that at least some of them were pretty huge by this description. Now Glaurung is hard to place size-wise as Tolkien never really says but as Father of Dragons he must have been quite large and so Tolkien seems to describe him. He also looks quite large in Tolkien’s drawing but this is one that could definitely be argued. 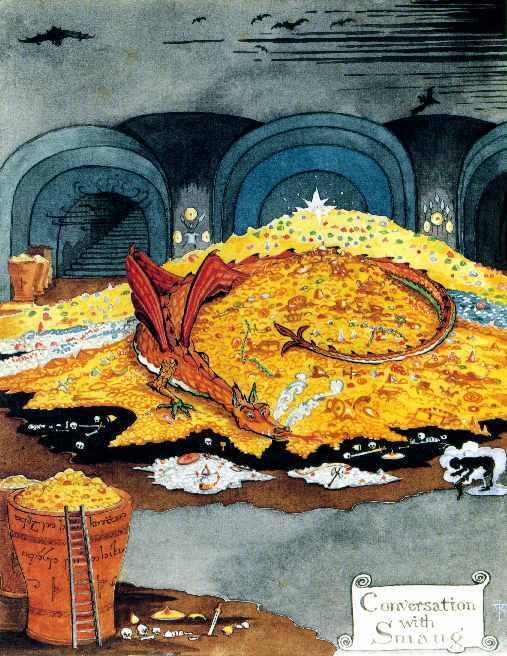 So in Tolkien’s early writings on the Fall of Gondolin found in HoME there are a good number of dragons at the Fall of Gondolin and they knock down the walls and stuff. Again, pretty big. Scatha the Worm was a mighty Long-worm of the Grey Mountains and one of the greatest Dragons to infest that range of the north. He was slain by Fram. Again, not much info so size reflects my best guess. So those are my sources, nice and simple. Again if you have anything more specific, send it my way.